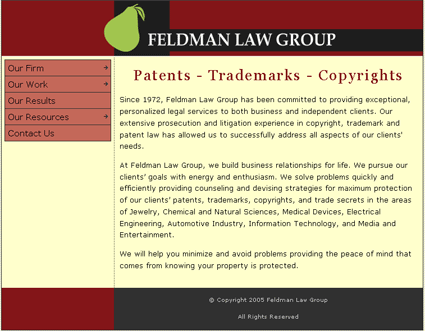 Feldman Law Group is a New York City based intellectual property law firm, specializing in the areas of patent, trademark, and copyright law. I was contracted to redesign their antiquated website and give it a modern, updated feel. The firm asked for a website that would be easy to update, so they wouldn't have to spend a lot of money on maintenance in the event they needed some. With that in mind I built the entire site from the ground up to run off of a database, complete with a custom CMS for updates or additions. They also wanted a simple, yet elegant look to the site so the content wasn't lost in flashy design. With that in mind, I tried keep the lines and colors simple, so as to maximize the visibility of the content.